Tomorrow I head off to Disney World with my 9-year old daughter. This trip will be a first for the both of us. I am super excited and so is she. I’ve read a lot and seen a lot regarding Disney World but it’s not the same as being there. This whole experience is completely new to me and I have no idea what to expect. I want to both enjoy the first time experience but also preserve these special memories. I have decided to take a camera along but I am now faced with a serious dilemma: do I take along the bulky Nikon D90 with a lens or two (and include my S600 flash) or should I take my Canon Powershot G12? Both cameras perform excellently and are obviously suited for both general and specific photographic situations. This destination is one of the most ideal reasons why I purchased my DSLR in the first place. I’ve taken my D90 during my business-related travels and abroad to Canada, Puerto Rico, Dominican Republic and France. The pictures from those trips were fantastic and I had a great time taking them. The wide angle lens is perfect for scenic or architectural shots while my 55mm-200mm lens is great for zooming in on people, wildlife and buildings. 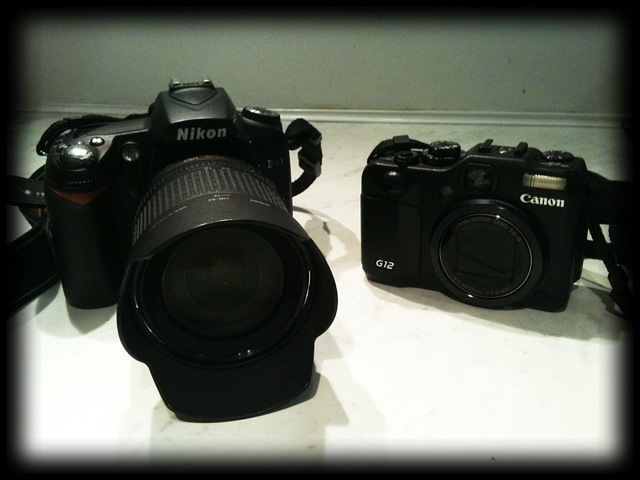 My G12 is a relatively new camera in my arsenal. It’s compact enough to put in a large pocket and it takes excellent pictures (I reviewed the G12 in a previous post). It has a great ISO range, good low-light performance, and the videos it takes are really crisp and clear. The convenience of it and all it’s great features in such a small form factor really trumps my DSLR. This camera truly is a photographer’s “backup” camera. Still, I am left wondering which one to take. I will have to make up my mind fast as the day is fast approaching! So which one did you take. I’ve got my Nikon D80 and a smaller Lumix. For me I think I’d take both. Hello Cee! I wound up taking the Canon G12 for several reasons. First, I wanted to simply be a participant and enjoy the moments with my daughter instead of seeing everything behind some large lens. Second, I wanted something smaller to carry around the parks so the form factor of this camera was perfect. Third, the G12 has excellent video capabilities and it was so convenient to shoot video while on roller coasters and other rides. Fourth, the camera is definitely that good! You’re bold carrying TWO cameras around! Let me know how it went. So sorry for the late reply. In a nutshell, I will recommend that you purchase that G12 and use it for your trip. I took my G12 and not only absolutely loved how compact it was but how much control I had over my pictures – a point-and-shoot simple camera this is not! Of course, if you want to set it up on “program” mode and cast away your worries, you can do that too. Another key benefit to the camera was the HD video mode. Not only did I take A LOT of pictures but I also shot short movie clips of my daughter to cut together of our trip when I have the time (going to be a year soon and I STILL haven’t edited the footage!!!). Riding on the rollercoasters and various rides was never a problem with my camera. I got great footage while riding the new Test Track ride. With the force of that ride pressing against your body, I don’t think it would’ve been safe to carry my D90 on it. I am totally pleased with the overal performance of the camera as well as the compact nature of it. I had it safely away from harm and it provided priceless memories of my daughter’s first trip (and mine) to Disney World. If you send me an email, I will link a small gallery of the pictures I took. Let me know what you ultimately decide to do and make sure to post some pics!